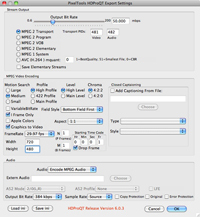 The PixelTools PC HD encoders ExpertHD and MPEGRepairHD can encode an AVI or MOV file or a sequence of TGA, BMP or YUV frames into a Netflix Version A-4-4 compliant High Definition (HD) or Standard Definition (SD) MPEG-2 stream. Netflix requires this high bit-rate and high quality format for delivery to their service for re- distribution. 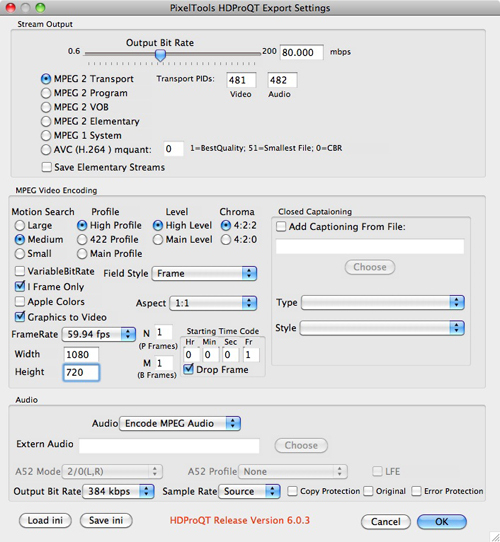 The HDProQT QuickTime export component, available for Mac and PC, and can also export Netflix deliverable streams from any Mac or PC application that recognizes QuickTime components such as Adobe AfterEffects, Final Cut Pro, and the Mac QuickTime Pro Player. Download the file PtNetflix.zip file to obtain configuration settings (ini files) that configure ExpertHD and MPEGRepair to generated HD or SD streams. The PtNetflix.zip file also includes screen shots of compliant configuration options for HD and SD when using the PC HDProQT QuickTime Export. 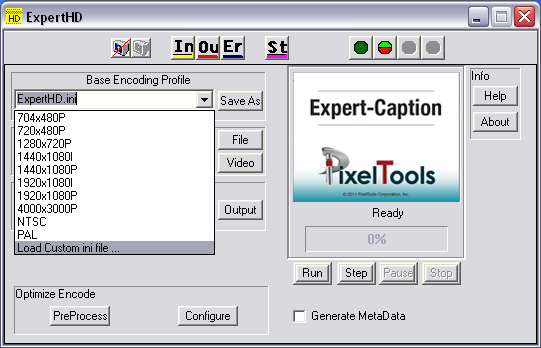 To encode Cable Labs content using MPEGRepairHD or ExpertHD, select the “Base Encoding Profile | Load Custom ini file” option as depicted below. Select the appropriate ini file from the PtNetflix.zip file to configure the tool to appropriateNetflix settings. 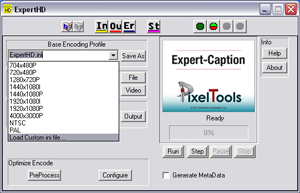 Select your Encode Input and Encode Output files and depress the Control Encode | Run button to start the processing. The encoder should compress your source video and then multiplex the video with your encoded audio per the Netflix specifications. Note that Netflix allows a variety of bit-rates and frame type combinations. Refer to the Specification below. To encode Netflix content using the HDProQT on Mac or PC, select the PixelTools HD MPEG Export option. Depress the “Options” button and then “Load Ini” button. Select the appropriate configuration (.ini file). The dialog settings should appear as below. Note that Netflix allows a variety of bit-rates and frame type combinations. Refer to the Specification below. PixelTools HD encoders comply with Netflix Digital Source Specification and Delivery Requirements Version A-4-4 dated November 13, 2011.